MobyDish just finished successfully delivering a 250-person office lunch from Blue Ribbon Fried Chicken!!! 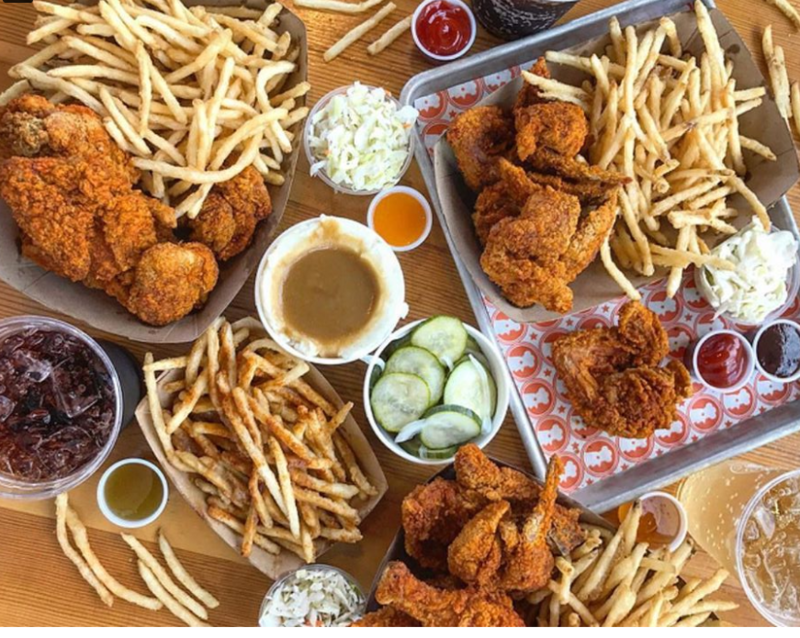 Did you ever think that your entire office could enjoy a delicious fried chicken meal from one of the top food names in the country?! As our team pulled up with the food, people were drooling as they got whiffs of the appetizing smell of fried chicken wafting through the office halls. Some were anxiously hovering around our team setting up the food, excited by the idea of Blue Ribbon Fried Chicken for lunch. Following the lunch, the office manager thanked MobyDish for bringing the office its highlight of the day. For your next corporate catering event, no matter how big or small, try Mobydish catering services to ensure only the highest quality of food and service. We work with only the top-rated, well-reviewed restaurants that cater, bringing you the best of each cuisine. Our team not only delivers the food, but they also set-up and lay out all the trays and utensils for ultimate readiness! 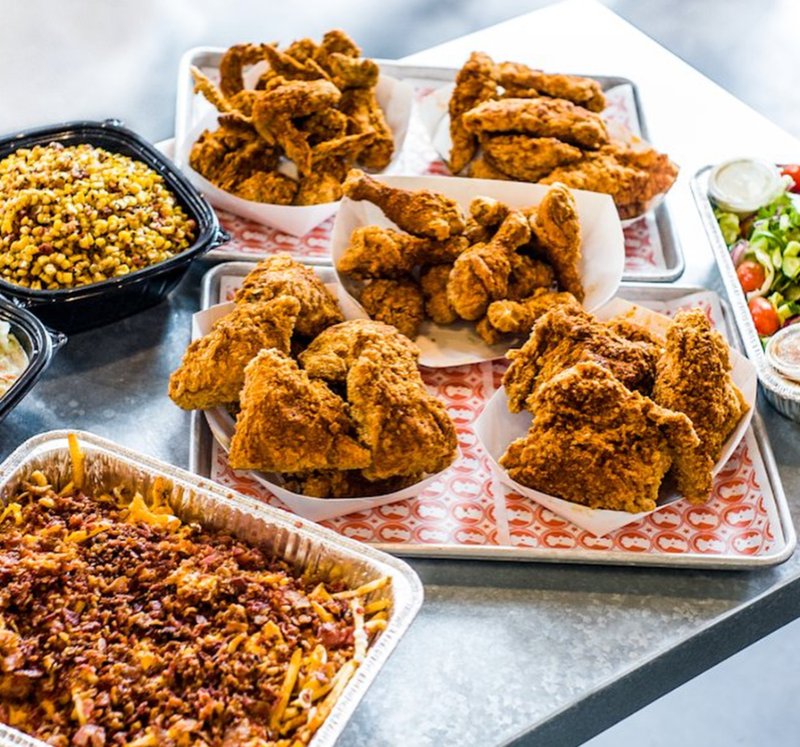 Read on to know more about the tasty fried chicken spot that served up this large catering order! 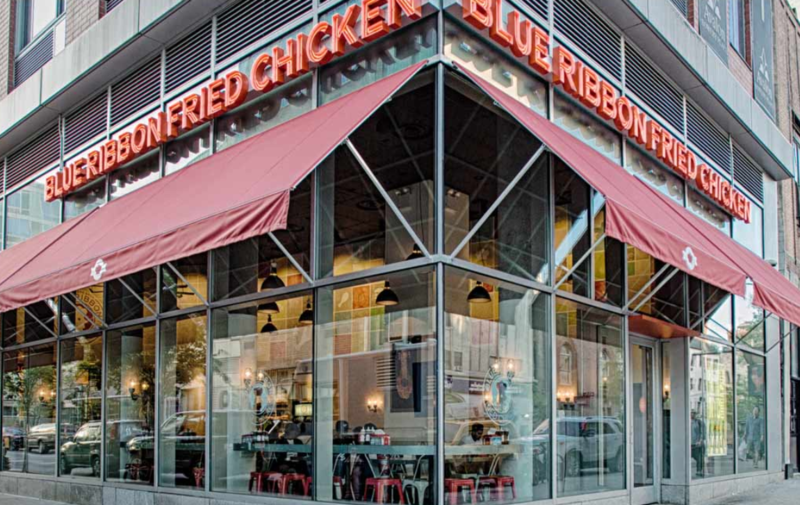 Serving Americans for over 25 years, Blue Ribbon Fried Chicken is known coast to coast amongst the nation’s best chefs and everyday connoisseurs of all things delicious. 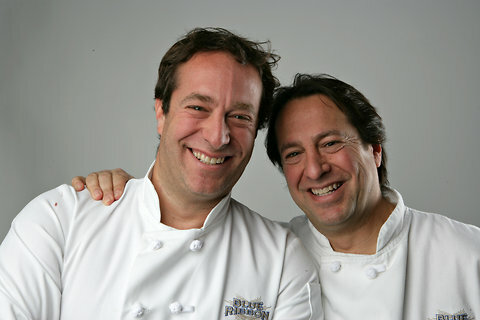 It all started back in 1992 when culinary brothers, Eric & Bruce Bromberg, were creating the menu for the original fine-dining restaurant, Blue Ribbon Brasserie. 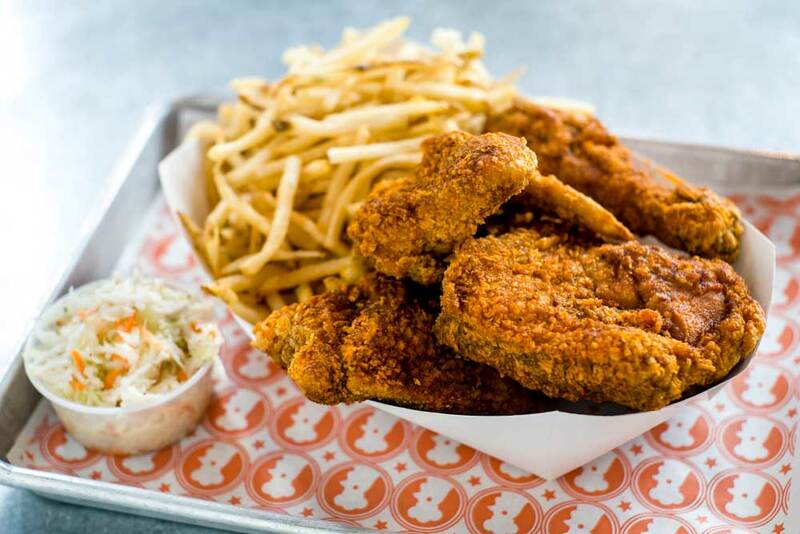 They wanted to find a way to incorporate their childhood favorite dish, fried chicken, to their menu, despite it being too casual for fine-dining. Many recipes and taste tests later, the brothers perfected what many people call the best fried chicken ever. Blue Ribbon became known as an industry destination, with the fried chicken becoming a cult favorite. 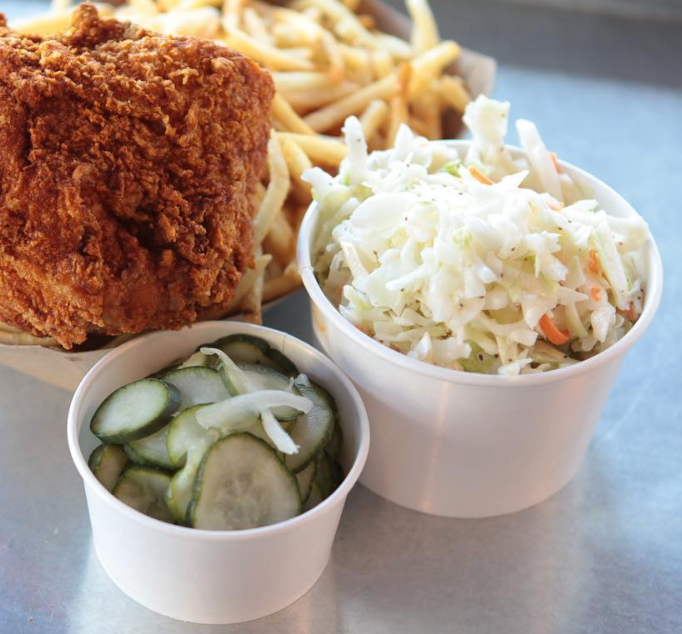 In 2013, the brothers finally opened Blue Ribbon Fried Chicken, solely dedicated to, you guessed it, fried chicken. 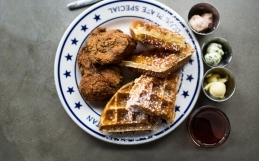 With its southern-style flavors, fried chicken doesn’t get better than Blue Ribbon! Click here to browse BRFC’s catering menu online with MobyDish. The Big Daddy for 100 pieces is the best go-to for party catering! Need more office catering ideas? 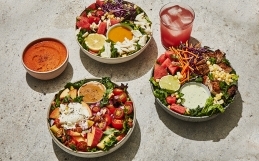 Read about corporate catering with Mighty Quinn’s BBQ, Root & Bone, Sweet Chick and Bobwhite Lunch & Supper Counter. 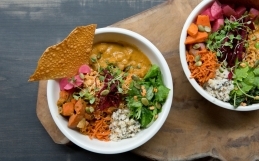 MobyDish is your one-stop shop for all things catering! Simply enter the details (date, time, headcount, budget) of your corporate catering event and browse through a wide variety of top-rated restaurants that cater in your area. 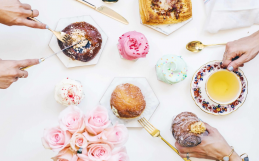 Whether you’re planning for a small group of ten or feeding your entire office, MobyDish will deliver and set-up your catering order to perfection and in a timely manner! As an office manager, you can just sit back and relax. You will get notifications of when Moby couriers are on the way, so there’s absolutely no stress on your end! Catering online has never been so easy!